At least 50 people, including 25 police officers, were wounded in Armenia after a night of clashes between police and protesters over a four-day hostage standoff, the country’s health ministry said. Wednesday’s violence in the capital, Yerevan, also saw the arrest of dozens of protesters. Demonstators throwing stones reportedly attacked police deployed outside a station where gunmen have been holding four officers hostage since Sunday morning. The hostages include Armenia’s deputy police chief General Major Vardan Egiazaryan and Yerevan deputy police chief Colonel Valeri Osipyan. Demonstrations continued into the early hours of Thursday as some 2,000 protesters built barricades in front of the cordons of riot police, who responded with beatings and arresting scores of demonstrators. 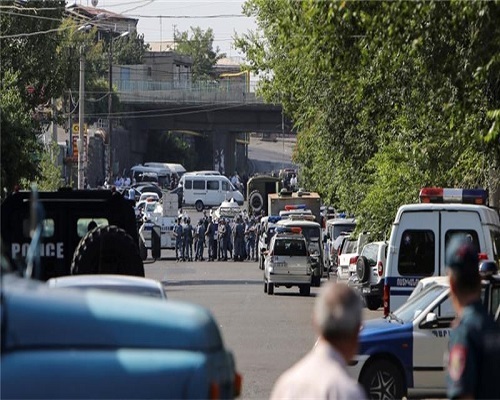 Gunmen seized a police regiment building in Yerevan’s Erebuni district on Sunday, killing one officer and taking several captive. The gunmen have demanded the resignation of President Serzh Sarkisian and the release of Sefilian, according to AFP news agency. They freed four hostages on Sunday and Monday but were still holding four others as of Wednesday night. Sefilian, the leader of small opposition group named the New Armenia Public Salvation Front, and six of his supporters were arrested in June after authorities said they were preparing to seize government buildings and telecoms facilities. An ethnic-Armenian, he was born in Lebanon where he fought in the civil war in the 1980s, defending Beirut’s Armenian Quarters. He then moved to Armenia to take part in the 1990s war with neighbouring Azerbaijan for control of the region of Nagorno-Karabakh. Nagorno-Karabakh is an area in Azerbaijan but holds an ethnic Armenian majority.